Everyone can play drums! I truly believe that anyone of any age, who is interested in learning how to drum, can do so. I’ve heard many friends around me say they wished they could play drums, but think they cannot coordinate their limbs, or have no rhythm sense. This is not true. If you can learn to drive a manual transmission car, or dance in a club, you can coordinate. Listen to your heartbeat and you will hear rhythm. Rhythm is within us! Many students rush to something new as soon as they can play the drumbeat for a couple of bars. But the journey doesn’t stop there! If you listen to any of the songs playing on the radio right now, they definitely don’t last only a few bars. Typically they are 3 to 4 minutes long. Proper practicing habits, focus and determination are key to playing drums, or to learning anything. One cannot expect to do well in examinations without revision and practicing. One might be a talented drummer, but without practicing, one can only go so far. Hard work will always pay off eventually. Remember the race between the hare and the tortoise? I have taught adults, teenagers and children as young as 3 years old. I use different approaches and methods for different age groups and I teach on a 1-to-1 basis, because no individual has the same learning approach or gradient. I incorporate the Los Angeles Music Academy syllabus into my lesson plans, but I recognise that every student has a different motivation for learning drums and I will work with you to achieve your goals. I also teach glockenspiel to young students in the comfort of their homes. To learn glockenspiel students must own or have access to a set for lessons and between lessons in order to be able to practice. I will recommend a book for students to use and music theory is included in the lessons too. With my 10 years experience of teaching percussion and 1-to-1 drumset, you can be assured that I will be able to teach you everything you need, from basic techniques, to concepts, to playing along with music, to transcribing songs and to playing music with other people. After all, music is more fun and enjoyable when you play with other musicians! 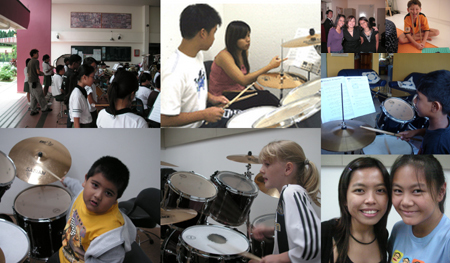 Jennifer NG accepts private students for drumset and percussion and for glockenspiel at their homes or at a studio. She is also available for percussion coaching and workshops in primary and secondary schools. Currently she is teaching on a freelance basis in Bukit Timah Primary School, ASPN Chao Yang School and a private music school.